Cervo is a pretty village on the Italian Riviera coast of Liguria in north-west Italy - known here as the Riviera di Ponente - to the south of Albenga and north-east of Imperia. It has both a beach area and also a medieval village on the hill behind. The village has a very long history: more than 2000 years ago, in the second century BC, the Romans established a stopping place here on the Via Aurelia, at that time an important trade route leading to France and Spain. 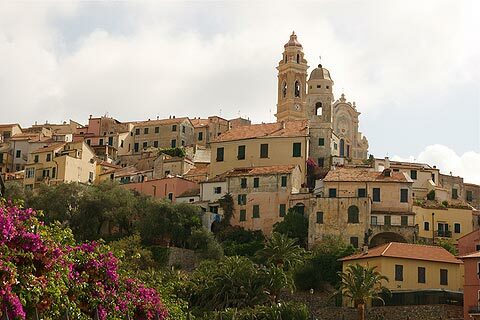 Cervo then acted as a shelter for pilgrims in the middle ages and is now a popular destination among 21st century travellers. While it is now rather devoted to tourism - not surprising when you combine the pleasures of the medieval village and the coast in one destination - the village at Cervo is a very picturesque cluster of houses on a hill behind a small stony beach and has avoided having too much new development. 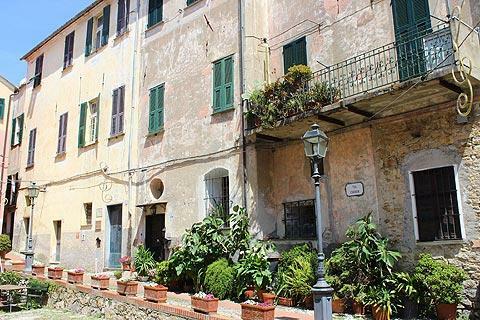 As such a visit to the village makes a picturesque excursion from some of the larger resorts that are found along this part of the coast, such as Diano Marina and Alassio. Most of your time will be spent simply strolling along (or struggling up!) the steep and winding cobbled streets, a pedestrianised region lined with ancient stone houses and various small shops and galleries. 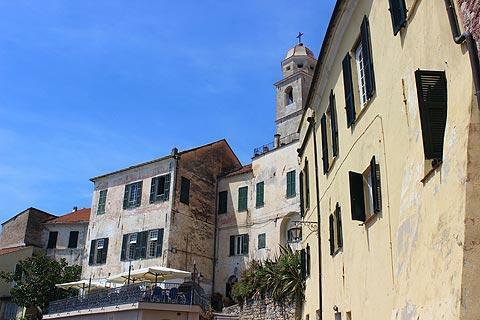 You can also see part of the original defensive walls, built in the 16th century to protect Cervo. 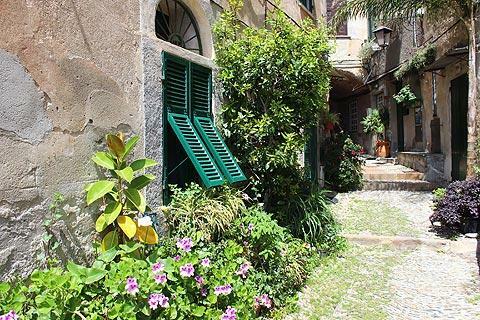 Cervo is officially classed as one of the 'most beautiful villages of Italy'. 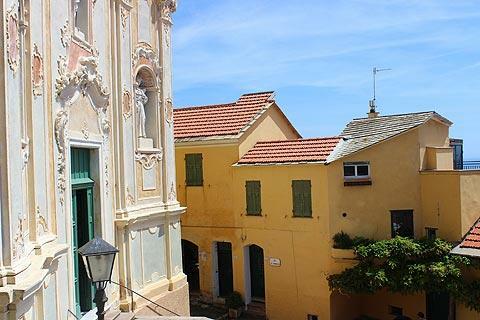 Continue climbing the steep streets and you will reach the elegant church of San Giovanni Battista (Saint John the Baptist) that stands above Cervo and has a facade that is a good example of the local baroque architecture. 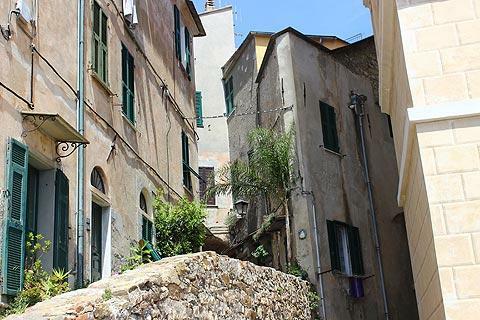 En route the abundant flowers and the colourful houses make Cervo less 'austere' than many medieval villages. During the summer the church is used for various musical performances, frequently by very highly regarded performers. The village also plays host to the prestigious Annual International Festival of Chamber Music, with its prestigious outdoor performances attracting many enthusiasts each summer, and several other music festivals. 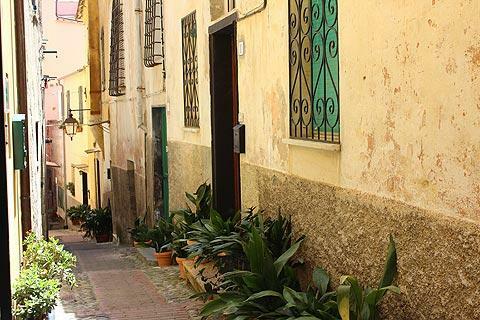 Unfortunately we missed it but there is also a 'day of art' in Cervo (the first Sunday in September) when the streets of the town turn into an open air art exhibition. 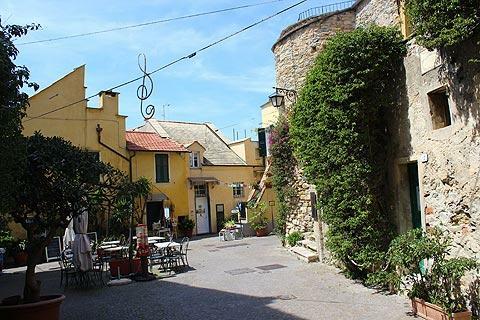 The Tourist Office in Cervo is housed in part of an 11th century castle at the top of the village. The castle is the oldest building in the village, and part of the very ancient stone tower that once stood here and was built from stone slabs can be seen from outside the castle. In the 12th century a fortress was built that incorporated the ancient tower, and defensive walls that can still be seen on the hill down to the se. A church was incorporated in the 17th century, the Church of Santa Caterina d'Alessandria. From the 18th century onwards the castle no longer served a military purpose so was converted to hold the village hospital. 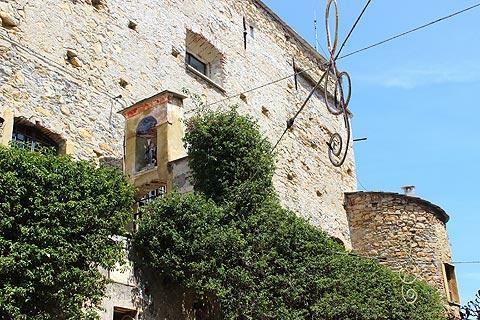 It is now holds Cervo Tourist Office and also a small Museum of Ethnography in Cervo castle celebrating the local heritage, and a fresco of Santa Caterina d'Alessandria can also be seen. During your visit be sure to enjoy the local specialities - in particular fresh fish and olive oil - in one of the town's restaurants. 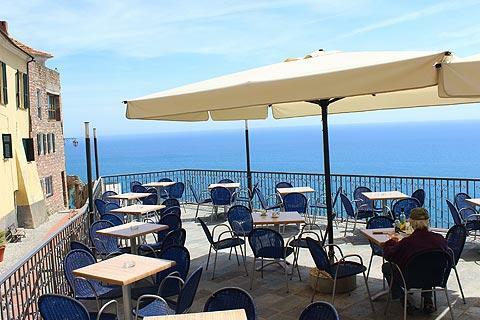 The small fishing port and resort at Laigueglia makes a pleasant excursion from Cervo. 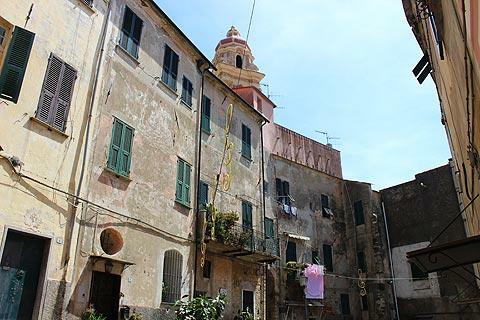 If you enjoy visiting medieval villages such as Cervo we can also recommend you visit Bussana Vecchia, a fascinating 'ghost village' close to Sanremo and south-east of here. 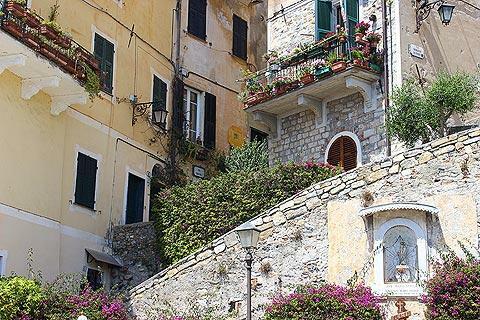 Imperia is a pretty coastal city in Liguria. Its beautiful orange buildings cover the hills above the clear blue waters below.